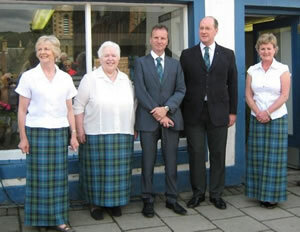 The new Aberfeldy Tartan has been hailed by MSP John Swinney as “a great marketing and promotional tool for Aberfeldy” at its official launch on Friday 31st July 2009. 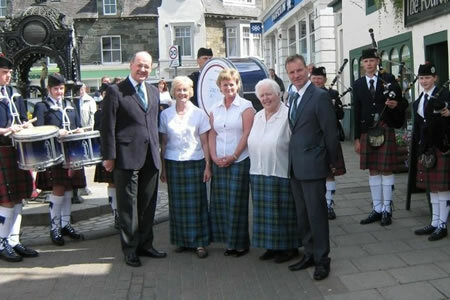 Susan MacDonald and fellow member of Aberfeldy & District Gaelic Choir, Kate Coaton, have arranged the design and marketing of the tartan, as part of a plan to upgrade and improve the image of the choir on stage. For a tartan to be registered, the colours must reflect the area and the traditions it represents – and the colours chosen for the Aberfeldy tartan evoke the watery Tay, the heather and the hills, and the strong association with the Black Watch Regiment. They are tied together with a delicate white stripe, representing the prehistoric ley lines which course the Aberfeldy surroundings and are said by many to be the reason for the area attracting a wealth of creativity and energy. A range of goods in the new tartan will be on sale at the temporary Tartan Shop in the Square from 10am – 4pm until Saturday 8th August. 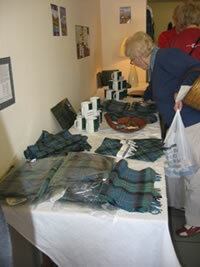 Aberfeldy tartan goods are also in stock at Haggarts of Aberfeldy, Wade Newsagents, the House of Menzies and Highland Safaris. 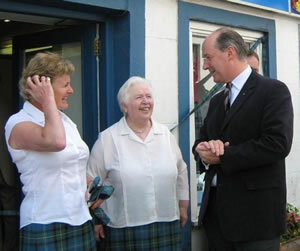 The tartan material is available from Strathmore Woollens in Forfar, and a website www.aberfeldytartan.co.uk dedicated to sales and promotion of the tartan, is currently under construction.